Where an application requires certain values at runtime, and where these values may be changed at irregular intervals, it is common practice to hold these on a database record rather than having them hard-coded into any program. This means that should any of these values ever change it is a simple matter of updating the database rather than changing, compiling and releasing individual program modules. This can be a problem, of course, if one of the modules is missed out. It can result in a very large record structure, which could be a problem as most database engines have a limit to the number of columns (fields) in a table. 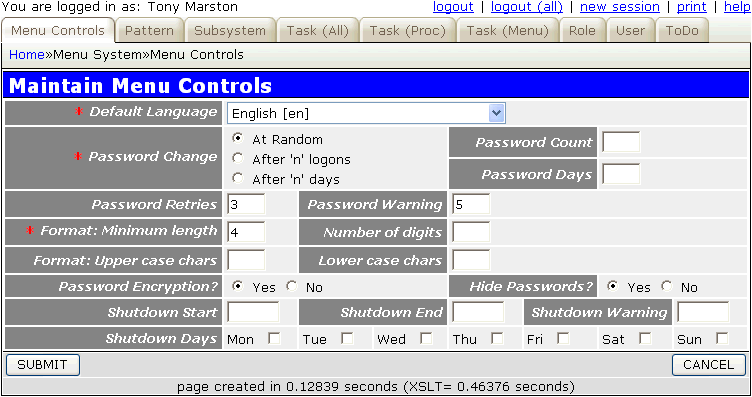 Adding or removing items on the control record requires a change to the physical database structure. All components which reference this structure would then have to be recompiled. Any component which updates any control data will have to lock the entire record. This may cause delays to other components which try to update the same record at the same time. After encountering those disadvantages on more than one occasion I decided on a different and more flexible approach. Instead of a single record containing many values I have each value on its own record, which therefore results in many records. The trick is to store these values in separate records in the database, but to present them to the user in a single screen as if they were separate values on a single record. How is this possible? Read on and learn. RECORD_ID is used to group various records into logical sets. The same table could be used by multiple applications, so by setting RECORD_ID to the application name each application's data can be kept separate from the other, even if any FIELD_IDs are the same. FIELD_ID is the name of the field, unqualified, in upper case. FIELD_VALUE is a string field as its holds any value in display format regardless of the interface definition (number, date, time, boolean, etc) of the source field on the screen. As you can see this looks like a completely normal screen, which is the whole idea. Although I have previous implemented this design in a different language this article shows my latest implementation in PHP using my own development framework. // Change the table configuration for the duration of this instance. // how often must the user change his password? // are passwords to be encrypted on the database? // are passwords to be visible in the update/enquiry screens? What fields need to be displayed on the screen. How each field should be displayed (i.e. which HTML control to use). How the user input for each field should be validated. // perform custom processing after database record(s) are retrieved. // NOTE: $where is passed BY REFERENCE so that it may be modified. This data is transferred to an XML document which is transformed into HTML by an XSL stylesheet. The information in the modified structure tells the stylesheet which HTML control to use for each field. Any field marked as "required" is not empty. All string fields contain strings which do not exceed their maximum size. All numeric fields contain numbers which do not exceed their maximum size, or fall below their minimum value. All boolean fields contain a value which is either TRUE or FALSE. // update multiple rows in a single operation. The getFieldSpec_original() method is used to replace the modified structure with the original structure. It then steps through the input array and extracts each field which it then treats as a separate database row. This row is then inserted or updated, as appropriate. Values can be added to or removed from the control table without having to alter the structure of the table. The structure of the table remains static while it is only the contents which are varied. Because individual values are held on totally separate records, individual values can be locked without affecting other values. Because each value is held on a separate record it is easier for the table to hold 1000's of records than it is for the table to contain 1000's of fields. By using a different value for record_id it is possible to use the same table for different sets of control data, such as for an individual application instead of the whole system.